One could make a plausible argument that THE TRIP TO ITALY doesn't really qualify as a movie. Like it's predecessor THE TRIP (2010), it's a British TV series that has been edited down into a feature length film (there's a little over an hour missing here). Also like it's predecessor, there really isn't a plot, or underlying theme. 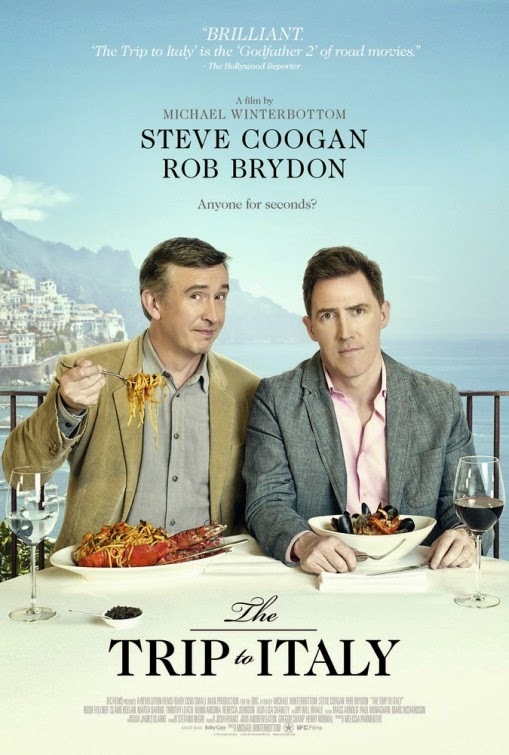 It's just comedians Steve Coogan and Rob Brydon playing slightly fictionalized versions of themselves as they visit various hotels, restaurants, and tourist destinations while keeping up a near constant stream of witty repartee and impersonations. Whatever it is, though, it's funny. Italy is a gorgeous country with many fantastic sights to see, and the travelogue aspects of THE TRIP TO ITALY certainly bear that out. But hell, there's any number of travel and food programs that could give you that kind of thing. What they don't have is Brydon and Coogan riffing on the cast of THE DARK KNIGHT RISES or imagining what the preserved bodies of victims of Mount Vesuvius might be thinking. Director Michael Winterbottom, who has made a number of fine films, really doesn't have to do much but make sure the cameras are running here, but sometimes just knowing to step back and let yours stars do their thing is the best choice a director can make. 3 out of 4 stars.